I wanted to try some new flowers in the flower bricks. Although they don't have the longest stems, I thought pansies might be suitable. They are just coming into bloom and easily available. This flower brick is from France where they are known as a vase pique fleurs. This is marked on the bottom: Decor de tradition, Vieux Moustiers, Le Petit Vallauris, 83160, La Vallette du Var, Toulon-France. This is the Culpeper flower brick. This is an Isis flower brick (by Deborah Sears). When I took this pic I didn't realize a chip was so prominent in the top right corner, front right! Sadly I think these pansies are too short to work effectively with a flower brick. I will continue the research! After seeing the flower bricks on Antiques Roadshow yesterday (2nd week of January 2014), I was inspired to push the hyacinth vases to one side, buy some inexpensive flowers and have a go at arranging them in my (reproduction) flower bricks. I did not know which were the best flowers to use and how many of each but in this case I was limited by availability and budget. This time it's red tulips and purple iris. but I see they do look better. One flower in each hole I think would be too much and wouldn't even fit. The holes in the Winterthur brick are smaller, too small for the tulips and irises. The greenery that came with the irises just fits. I need to see how the iris look when in bloom. I'll probably have to shorten them even further. I've filled all the bricks with water (through the larger central hole). I think that's a good number of tulips in the Culpeper brick. I have not been able to find any period examples of flower bricks with flowers (eg paintings or illustrations) but from my experimentation I think less is more, the smaller the better with flower size and not every hole needs a stem in it. I will try other kinds of flowers and post results here. I have a fascination with Delft period style flower bricks (my budget does not extend to real antique flower bricks). One of the best I've come across is this one from Culpeper, designed by Rodney Shackell, as marked on the base. Isis Ceramics flower bricks are also very nice but tend to be quite expensive (one pictured in the selection below). It is my dream to put period style flowers in them but I don't know exactly what flowers to use. I need to research further what flowers would have been used. Here are some other modern reproduction Delft style flower bricks. The large hole in the middle is to fill them with water and the small holes for flower stems. The base of the top flower brick, a Winterthur reproduction. The base of the Isis flower brick (2nd from the top above). It has quite a lot of crazing. I don't know if that's standard for these. 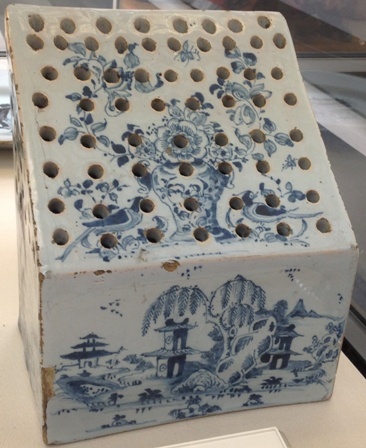 Here is an 18th century (Bristol, 1750) flower brick I saw this week (July 2013) at the British Museum. I understand there are some at the Victoria and Albert Museum which I hope to go to see soon.